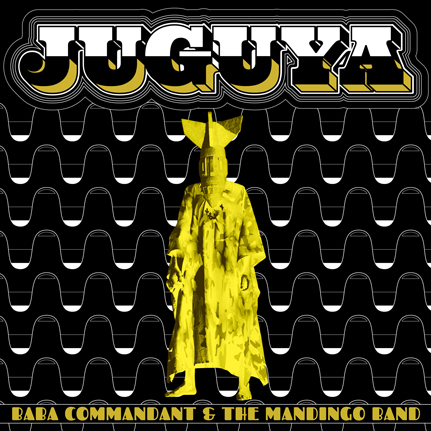 Baba Commandant and the Mandingo Band are a contemporary group from Burkina Faso. Coming from Bobo-Dioulasso, the group is steeped in the Mandingue musical traditions of their ancestral legacy. The enigmatic lead singer Baba Commandant (Mamadou Sanou) is an original and eccentric character who is well respected in the Burkinabé musical community. A sort of punk Faso Dan Fani activist for traditional Mandingo music, Baba continues to redefine the boundaries between traditional and modern. In 1981, he joined the Koule Dafourou troupe as a dancer. Later, he embarked on his current musical direction as a singer first in Dounia and then in the Afromandingo Band. His current band — when he’s not playing with the now-famous Burkinabé musician Victor Démé — is the Mandingo Band. At present, he is a practitioner of the Afrobeat style, drawing inspiration from the golden era of Nigerian music. Fela Kuti/Africa 70 and King Sunny Adé are big influences, as is the legendary Malian growler Moussa Doumbia. Baba Commandant plays the ngoni, the instrument of the Donso (the traditional hunters in this region of Burkina Faso and Mali). His audience comprises multiple generations and strata of Burkinabé society; he accordingly adapts his repertoire to his surroundings, which range from cabaret Sundays in Bobo-Dioulasso to the sound systems of Ouagadougou. Baba Commandant and the Mandingo Band are a formidable force steeped in Ouagadougou’s DIY underground musical culture. Juguya is their sound. Limited-edition LP housed in a Stoughton tip-on sleeve.